En RouteHQ - Share your trip no matter how you travel! Its fun! Your location for a reason: whether you are visiting friends, going to a meeting, seeing your parents or going to a concert. Share your location, when you are on a trip, it's fun, simple and above all - Useful! Visiting your parents or family? If your parents or family live far away, chances are you drive there for visits. Load up En Route and they can track your trip via the En Route HQ website. Going to a meeting? Load up En Route and email your Trip PIN to the meeting contact. They can now see if you are on time or if you are running late. Coming home from the meeting? Your family can track you to see when you will be home. Travelling to a holiday home with some friends for the weekend? Load up En Route and double your fun as you track where everyone is. Going to a meeting with colleagues from several locations? Load up En Route to show how far everyone is from the meeting. Returning to College? Load up En Route and see where all your friends are. Going to a festival? You guessed it! Load up En Route! And it all works from your GPS enabled iPhone or from your iPod Touch/the En Route HQ website(for tracking only). En Route is not about letting someone know you are in a coffee shop, or that you are at your friend’s house, or that you are out and about around town. It is Location for a Reason. It lets people know where you are when you are on a trip or journey. 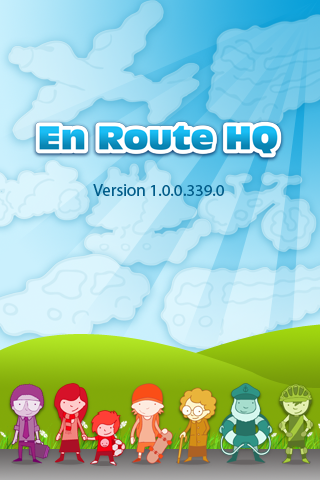 En Route is a trip management application. 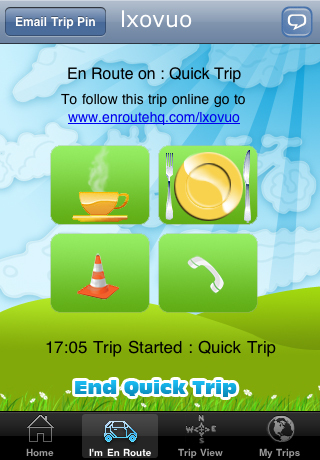 Via your iPhone and the En Route HQ website you can setup your trips, take a trip and let people know where you are when on those trips. It’s great for home and business use. Your friends, family and colleagues can see where you in your trip without calling you, you are driving after all! En Route HQ is great fun to use and it’s useful. We are going to enhance the application with lots of great new features over the coming months, so stay tuned for more. If you have downloaded the app and are using it – thank you! Be sure to give us a rating and tell us how En Route helps you keep people informed of your trips.